Zeus Scientific is a highly trusted developer and manufacturer of clinical diagnostics. Its products span three technology platforms, ELISA, IFA, and Multiplex. For decades, the company’s products were sold under a brand name owned by the distributor. Zeus Scientific now needed to take control of its own marketing. 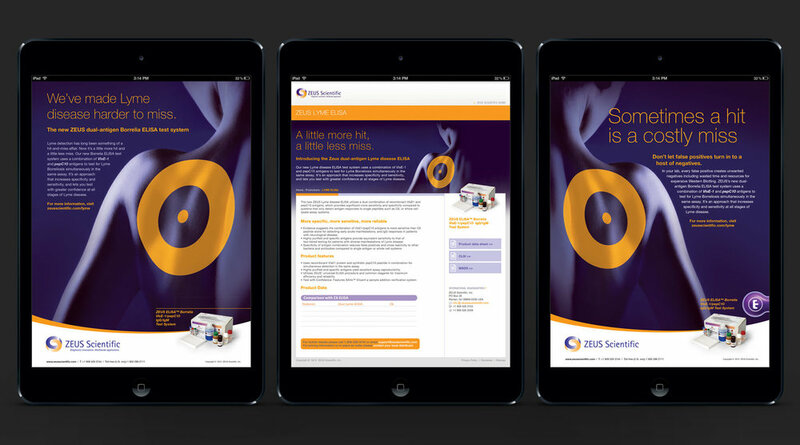 We were invited to help consolidate the company’s products under the Zeus Scientific brand and refresh its identity. East House developed a common packaging design to unify Zeus Scientific’s several hundred offerings. To differentiate them by technology platform, we incorporated a color-coding system structured around three different droplet icons. NEW BRAND LOOK-AND-FEEL. NEW BRAND VOICE. In Lyme disease testing, false positives are costly. False negatives can be deadly. Lyme disease itself is notoriously unpredictable. The iconic bullseye rash appears in less than three out of four cases and the disease can lie hidden for years. To address this uncertainty, Zeus Scientific developed an innovative dual-antigen system that more effectively tests for both recent and distant infection, all but eliminating false negatives. We were tasked with helping launch the new product. Theme: We’ve made Lyme disease harder to miss.